This combination is an inbreeding on Ph Gr & Am Ch Lenches Gallivant 2-2. The inbreeding coefficient is 17.5%. 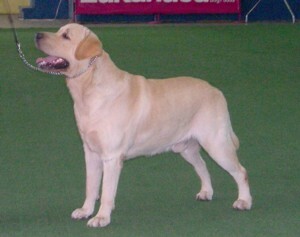 The sire - Blue, is an outcross with an inbreeding coefficient of 3.5%. Blue is distantly line bred on poolstead preferential. Blue's pedigree is very much driftway with his dam being a linebreeding on driftway regal oak. I have had good results in all of my two breedings combining driftway lines to george. Molly's inbreeding coefficient is 8% on kupros master mariner and sandylands charlston. Molly is the dam of angelfields rain in spain. 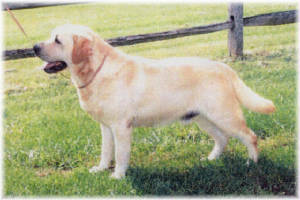 Molly's first litter was sired by Magic who had driftway lines on the third degree of the sire side. Molly is a very intelligent. 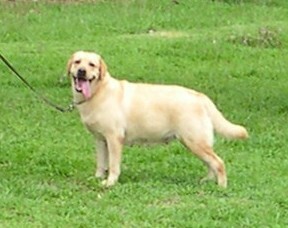 She loves to fetch and has a natural instict to retrieve which she acquired from her mother. The entire litter has exhibited good working traits and we will certainly build on these good traits as we develop a dual purpose labrador line at angelfields. Her daughter Rain inherited all her mothers fetching traits, and i look forward to getting rain to do some field work. Blue's phenotype is very much like his father george while molly takes after her mother genie with a beautiful rear from george. This is an important breeding at angelfields as george is certainly making footprints in our breeding program and we hope this inbreeding will flush out all the good and bad traits we need to know as we move forward in our breeding program.